I’ve often found myself speaking to a Homeowner or Builder about the term “Thermal Barrier” . This week I ran into the perfect example to explain. It quite simple in one respect and not so in another. It’s that the insulation is the thermal barrier. But when its not aligned it’s a big issue. So imagine this, you are lying in bed and getting too hot. The blanket is your thermal barrier. But if you stick out a foot or leg as we do to cool off, that is a thermal bypass. That works to help us thermoregulate, but in houses? It would be like opening the window to cool the house while leaving the furnace run full bore. Doesn’t make much sense does it? So how does this relate to the insulation in the walls and attic? Picture this now, in an average house you have insulation in the attic and walls and in new home insulation in the basement as well. And it’s the basement that I’m looking at here in this example. You can either put insulation on your walls, all the walls or in the ceiling. This makes the continuous thermal barrier, which is key here. But what if for one instance we have insulation on some of the walls and some of the ceiling? This is not continuous and is a thermal bypass. The cool air radiates in through the uninsulated walls into the partially insulated basement and makes the uninsulated space/floor cold. Here is the picture that I’m thinking of. This builder did just that. Parts of each component are insulated but not all of either. That is the issue. Remember the example of the leg sticking out of the bed, the uninsulated wall is an issue unless you were to insulate all of the ceiling. You want to be sure that you have continuous thermal barrier alignment for this to work! So remember the thermal barrier in a house is a thick warm blanket that wraps the house. Something left open is a bypass and lets out the heat. By the way this is just as true in cooling seasons too. Last time we spoke about the benefits of building a tight home and some consideration for that home. This time, let’s look at ways we make homes good and tight. These are common things that often get overlooked and forgotten in the process of building a home. It is now fairly standard to have the Super Seal package. That is caulking all seams and joints in the stud prior to the walls being closed. Areas that are often overlooked are multiple stacked studs, kings, jacks and cripples. These seams should be caulked as well. If there is a wooden lolly column instead of a steal column, each seam should be sealed. Receptacles in exterior walls are a big weak point. Receptacles for the interior and exterior in these walls should be sealed and insulated well. Sometimes we just stuff fiberglass behind them. This is no good. It does not seal leaks and the insulation usually is compressed greatly. Best is to foam in the back side and/or cut the insulation to fit nicely. I have seen one builder get styrofoam boxes made for this purpose. They attach to the stud over the box. The penetrations for the wires get caulked or foamed in. The face of the box is flush with the stud to help with sealing the entire unit to the drywall. In advanced sealing we often recommend gluing the top plate of the wall to the drywall that is adjacent to the attic. One builder I know uses simple weather stripping to seal this joint, this real well. However, you often cannot rely on the drywaller to glue this. This is unusual for many. Here they sealed the edges but forgot to seal the box itself. The wall for the garage here was sealed well above the ceiling. This is often forgotten. The standard foam sill seal is often not enough. A bead of canned Great Stuff foam can do the job just right. This goes well for all the utility penetrations in the foundation. The sill and band joist are critical. Here they forgot to see the 1/4′ gap for 2′ along the band joist. Another energy efficient item, Lighting. The IECC requires 50% energy efficient lighting. Advanced programs require 80%. It is not a huge cost to add more energy efficient lights. One of the lapses I see in lighting is in recessed units. Often they are incandescent for dimming purposes. The standard CFL bulbs don’t like to dim. The better alternative is LED bulbs. If the customer wants an abundance of recessed lights I would tend to direct them in the direction of LED lights. Standard incandescent lights consume huge amounts of energy and produce a lot of heat that has been known to challenge the homes heating/cooling syst ems. I won’t speak about efficient HVAC Systems, since we all know that fairly well. However if they are not installed well, that efficiency literally goes right out the roof. I’m speaking about duct work. Often duct returns are in cavities that are unsealed. This allows the conditioned air to transfer and draw in air from the outside. This is very old school, the better way to do this is to hard pipe the returns. In the next revisions of the IECC this will be a requirement. Let just do the right thing now. The issue is the returns and the top plate leak significantly because they are usually poorly sealed and not insulated well. The cavities themselves breathe through the receptacles that the electrician put in the cavity as well. A compromise to this is completely seal the cavity with thermopan. Then seal edges and seams with caulk and or mastic. The duct tape does not sick to the wood stud. I have seen it peel off the wood studs in a matter of weeks. Here is an switch that is sealed that is in a return. But in the same house there are floor cavities used as returns, not recommended. The thermopan is vertical in the bay, but when the ceiling is placed there will be gap at the bottom that will never be sealed. This leaks not just to the interior, but this cavity as we saw before can be directly connected to the outdoors at the band. Windows are expensive and are important. But if they are not installed well, they can be an issue. Usually I have seen that window units themselves are not the issue, but poor installation is at fault. In the 2009 IECC check list it states that you cannot use any insulating product as an air sealing method. In simple terms what this means is you can’t use fiberglass to seal the frames of window. It never works. The only way to do it properly is to use the correct foam or caulk. I have seen all too often it is the space around the window that leaks, not the window! How can the US gain the lead in Efficiency Building? Fall is one of the seasons that homeowners often think about keeping their houses warm and keeping the operating costs down. Once the home is built it can get tricky and complicated at times. But that is existing homes. For a new home we want to build well right from the start . To give a little perspective, when we look at the broader view of energy efficiency, the US ranks near the bottom. The American Council for Energy Efficient Economy reports in the International Energy Score Card* that out of 16 of the largest world economies , the US is near the bottom at 13. This is across all energy sectors, but when looking at Buildings alone it is not much better. “ The United States –long considered an innovative and competitive world leader – has allowed other nations to surpass it” the report states. We can do better, we need to walk the talk now and step up and be the leader with home efficiency. Because we lag, it is a new industry to us. Investment in this will stimulate jobs as we all say we need to do. On a smaller perspective what this can do is create a competitive edge for builders. I have long said that the new home buyer is a discerning buyer that wants to know “what kind of mileage” are they going to get with their new home. Building efficiently is the next direction. So how do we do this …. There are many things that we currently do, some well, many not. First let’s answer that age old issue about building a tight home. Yes a house needs to breathe, but do we need to live in a barn? With the most common energy code, the 2009 IECC, the minimum threshold is a max of 7 air changes per hour. I have tested many homes that could make that limit. Some cannot though. If you could feel the air moving through the house, you would understand that 7 ACH is a fairly low standard to reach. 7 ACH is a lot of air. Most homes being built today can reach this and better. Now, making homes tighter is more efficient, BUT we must consider a few things in this. I have said to homeowners after the fact, you can put all the energy upgrades you want in the house. If you don’t pay attention to the structure, the shell of the home, you are just wasting energy more efficiently! We need to seal the home up. Back that nagging question about living in a tight home. It has been long documented that if you have a tight home there is a separate set of issues that need to be addressed. In certain instances a tight home can make indoor air quality suffer. That could mean in ways of indoor air pollutants, off gassing of products, moisture is a big contributor. To deal with these pollutants, we need to ventilate. There are three means to do this; some are more costly than others. And likewise some are more effective than others. 1. Supply only strategy is when you have an inlet in to the return plenum prior to the filter from the outside. It must have a damper. In the mid-Atlantic area this is not recommended. It doesn’t get the pollutants out and it dumps a small amount of 100% unconditioned air into the system. 2. Exhaust only strategy is a preferred method often utilizing upgraded bath fans. They are programmable and can run continuously at a small amount from the bathroom, usually the point source for the moisture contamination. Broan Nutone have some great fans for a reasonable price depending on the features you get. Some of the basic silent fans are about $145 and up. Again remember you are building a tight efficient home at this point, ventilation is needed, this will take care of the off gassing of materials and vent excess moisture and help insure it is a safe place. 3. Lastly is the “Cadillac” strategy of an Energy Recovery Ventilator (EVR) or a Heat Recovery Ventilator (HRV). These are units that sit adjacent to the heating unit and draw a small amount of fresh air from the outside and inside at the same time. The air is exhausted through a heat exchanger where it tempers the incoming air. The efficiency of these can be in the 70% range. As you can imagine these units are costly, often $2000 and up installed. The advantage is that they draw air from all points of the house, not just a point source like a bathroom and they do not waste as much energy. The differences between an HRV and an EVR are subtle but important and deal with moisture and each are better suited to specific climates. One is better in far northern climates than the other. An HVAC professional can help with choosing the one for your buildings. Some of these strategies and practices you may currently use. Perhaps some are not standard for you. . However there are incentive programs in PA that offer consulting and guidance as a resource for you, the builder. There is the Penn Residential Energy Codes Initiative* . Which provides an opportunity for a free limited ResNet HERS Rating* for those that have not been introduced to the HERS System. You can have a complimentary Rating that identifies ways that you can improve your homes. Then it can provide factual information on operating costs as well as much more information about the performance of the house. It includes complimentary site visits and testing as well. For those that are familiar with a HERS rating, the utility providers in PA have programs designed to account for the increased energy savings you have built into your homes as compared to a Code Built home. A Rating is performed and the energy savings are calculated in KWH. Depending on the utility, you can get $0.10 per kwh with First Energy*, and $0.30 per khw with PPL*. But you will need a Rater to certify it. All electric homes are best suited for these programs. Geothermal homes should strongly consider these programs as well. Rebates can reach $2000 in some cases. Stay tuned for more How To in the next issue. For more information contact a Rater today. Here at East Penn we do a variety of things. We offer consulting on both sides of the fence from Code Enforcement and education in helping Builders comply with code and assisting with building more efficient homes. It’s a fine line but very rewarding. In many cases Code Enforcement is not glamorous. We are often looked at as Big Brother watching, or more recently “Big Government”. But I tell you it is all about health and safety. In the coming weeks I will post some noteworthy items that were found. Some from Energy Consulting and some from Code Enforcement. This can give you an inside look at what I do. Today issue comes from an Energy Star home that I worked on about a year ago. We were in the final stages of delivery. In fact the house had its Occupancy. I was there for the Energy Star final checklist. The occupants were in the process of moving in. The trucks were there! As the inspections goes on, I bother to look up in the attic to verify the attic insulation. Attic insulation is something that happens most often late in the process, so it often doesn’t get verified until final inspection. So this is what I saw. I texted the builder while in the attic, “Hey, am I/we missing something?” He freaked out; he knew the folks were moving into a house with no attic insulation! In 2 days he had the Insulation Company there to fix it. Ultimately the code folks missed it, these new home owners were moving into what they thought was an Energy Star home complete with a new Geothermal heating system (but no attic insulation). Fortunately the builder was right on it and very appreciative. It was clearly a breakdown in communication internally with his staff and scheduling. The home owners did not know much about this snafu, we saved some face for the builder and all were happy and warm! Skilled Construction Labor needed, where did they all go? Here is a perspective that has merit. We often here about the need of skilled labor. We had lots of skilled labor once. Jeffery Sparshott from the WSJ has some thoughts on this. The Wall Street Journal has chronicled builders’ complaints about a shortage of construction workers and wondered why the labor pool appears so shallow when employment levels are still well below those of the boom years. 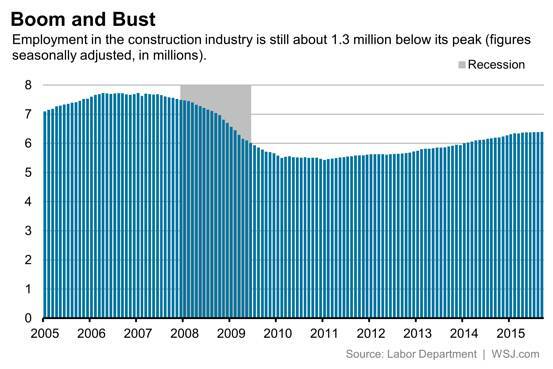 Indeed, industry-wide employment cratered from 2006 to 2011, losing nearly 2.3 million jobs. It’s gotten well less than half of those back. Where did they all go? Well, the Census Bureau’s job-to-job flows program tracks workers as they move in and out of industries. The data isn’t that easy to use and underlying microdata isn’t public, but agency economists Hubert Janicki and Erika McEntarfer dove in recently and came up with some interesting findings. About 40% stayed in construction, either returning to their former employer or landing with a new one. About one-third switched to another industry, but only after sitting on the sidelines for more than a year. Typical destinations included work as general laborers, landscapers and truck drivers. Contrary to conventional wisdom, few headed off to the booming oil and gas industry. The mining sector–which includes oil and gas extraction–accounted for less than 5% of new jobs for former construction workers heading back into the labor market. And about one-quarter of displaced construction workers were still out of work five to seven years after they lost their jobs. “These individuals presumably have left the labor market, although they could be working informally or be self-employed,” Janicki and McEntarfer said. The two researchers also looked at industry hiring to come up with another possible reason for a tightening labor market within the construction sector: Simply, construction companies didn’t hire enough young workers. Those young workers went into other industries. In short, our analysis of the data suggests that 60% of displaced construction workers have left the labor market or moved into other industries. Although some former construction workers transitioned quickly to other sectors, for most, a move into another industry occurred after a long spell of nonemployment. Also likely contributing to a shortage of experienced workers is a shift in hiring preferences—during the downturn construction firms hired fewer young workers, fewer young workers gained experience in the industry, and the share of older workers grew faster than in other industries.